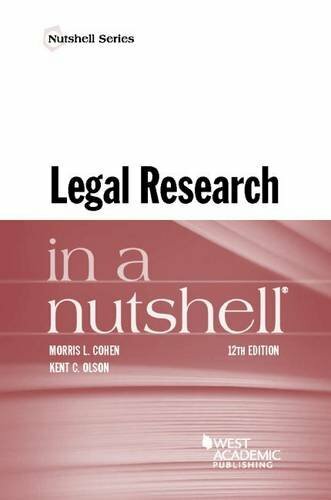 Morris L. Cohen & Kent C. Olson, Legal Research in a Nutshell (West Academic Publishing, 12th ed. 2016). This site is maintained by the University of Virginia Law Library. Please send updates or comments to nutshell@virginia.edu. § 1-4. Black’s Law Dictionary on Westlaw. § 1-4. The Wolters Kluwer Bouvier Law Dictionary. § 1-5. Cardiff Index to Legal Abbreviations. § 1-6. Westlaw main search screen. § 1-6. Lexis main search screen. § 1-6. Bloomberg Law main search screen. § 1-6. A Westlaw advanced search screen. § 1-6. A Lexis advanced search screen.